These aren’t mindboggling tips that I’m about to share with you, but if you’re losing weight clothing can get really expensive and I want to share some tips that I’ve personally found helpful! 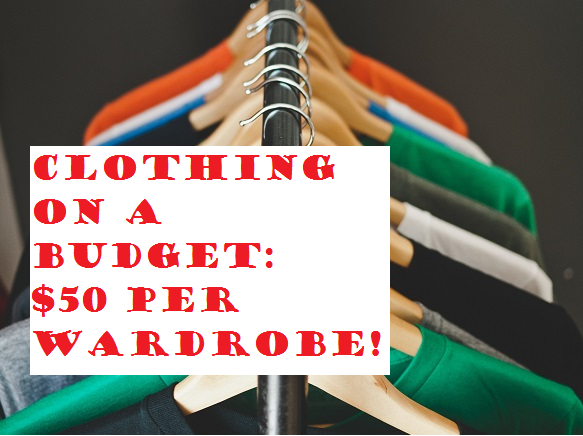 Sometimes even thrift stores can be out of our price limits with $5 clothing pieces. That’s a whole lot cheaper than a brand new piece of clothing in most places, but my trick is using the sales days at thrift stores to hit the jackpot. My personal favorite is the 50% off day at Goodwill, but there isn’t one of those everywhere and I’m not sure if they have that sale at all of their locations either. However, nearly all thrift stores have a day where clothing is 20-50% off at least once a month to get people coming in. So my suggestion is to do your homework and go on those days, get as many quality pieces of clothing as you can. You might even find a brand new piece of clothing with a tag still on it for a lot cheaper than the store. I know I’ve found at least a few such pieces in the past year. The good thing about thrift stores is they have almost every type of clothing right there, usually pretty well organized in sections. You can find shirts, pants, skirts/dresses, jackets, sweatshirts, shoes, etc. The downside of course is that they are nearly all used clothing. If you don’t have a problem with that after a good washing at home, then this is a great place to get your clothes. Chances are you have 2-3 different thrift stores (not all chains) in your town with sales on different days where you can hit them all and get even more bang for your buck. Also, don’t forget to go early in the day so that you have even more pieces to choose from! Obviously this is another choice where the clothing is used, but sometimes we can’t be choosy if we want to save money on our clothes as we lose weight. The good thing about yard sales is that you can haggle, and get the price per piece of clothing down even lower than they marked the clothes for. How much each piece of clothing is depends on the person holding the yard sale and the brand of clothing. However, you can get clothes for as little as $0.50-1 a piece with some where they just want to get rid of clothes. Of course, some might be as high as $5 a piece or even more expensive depending on different factors. The downside of yard sales is it’s harder to find clothes in specific sizes unless they advertise it ahead of time, and it’s also harder finding exactly what you need if you’re looking for something specific. If you have the time and gas though, search newspaper and online ads and see who is posting sizes and/or just go out yard sale hopping! Now here is an option even when you don’t want something used… hit all those clearance clothing racks at various stores. Kmart and Walmart might give you more choices for less money, but Target and other stores are great as well. If you know the system they use to mark down their clothing, you could save even more money. These systems are sometimes posted online and on social media by people who used to work at these stores. I know my mom has given me tips for different stores that she’s worked at, but I can’t for the life of me remember any because I don’t go shopping often lol. Keep track of the sales at the stores in your area. Sometimes you can find great sales and coupons in the ads! This saves a lot of money if you’re diligent! I know bigger department stores such as Kohl’s and JC Penney’s sometimes have coupons in their ads, to get a certain amount off if you spend a certain amount or more. This is more expensive as their clothing is more expensive per piece, and some have exclusions like no clearance. A lot of them will allow you to use the coupons on sales items though, so choose wisely! Obviously with Thanksgiving coming up soon, you could also shop on Black Friday if you’re brave enough and find many deals that way as well. I’ve never done this myself but I’ve heard and seen great deals advertised for that day. There are more and more of these types of stores popping up places: $5 a piece or less! I know one just opened in my town and before when I lived in California there was one as well. Sometimes the clothing is very cheaply made though, but it could serve it’s purpose while you’re losing weight since you only need it temporarily until the next size. However, if you want quality clothing, take a peek at these stores and try the other tips mentioned as well. Now I’m sure I haven’t listed everything out there as I’m not a big “bargain hunter,” but these are some of the things I’ve done myself over the past year or my mom has done in her own weight loss journey. I have spent as little as $50 on each size’s wardrobe as I lost weight just by going to Goodwill’s 50% off sale a few times. I usually browse different sizes and grab a few in each size that I will be fitting into soon to be prepared for that size. I have found many cute and beautiful items there which is super motivational! Using all of these tips, you have a great chance of spending a mere $50-100 for a wardrobe that should fit you anywhere from 3 to 6 months as you are steadily losing weight. Other tips would be to make your current clothing last longer by using a belt to hold up your pants to make it last a couple size reductions. I have also used a scrunchie/hair tie at one point to tie a baggy tee shirt to the side like the style of a long time ago, just to make it look less baggy. You could also save a little each month to do this budgeted clothes shopping or for even more expensive clothing while losing weight. Each little bit will add up and take some of the pressure off when the time comes. I personally like to look as sharp as I can in whatever clothes I am wearing: tee shirts, workout clothes, jeans, skirts, dress pants, etc. so I like having a variety and the tips above have helped me do so!